The “other white metal” is making its presence known and it won’t be long before light, bright and white 950 palladium products find their way to your workbench, either as merchandise from your store or customers’ jewelry taken in for service or alteration. Notable designers and manufacturers like Frederick Goldman, Scott Kay, and Lieberfarb have incorporated 950 palladium products in their bridal lines for over a year. A growing list of 950 palladium suppliers and manufacturers of sheet, wire and casting grain as well as findings and mountings like Keystone Findings, Telford, PA, R-Findings, Rochester, NY and PMI, Dallas, TX are creating products for the supply and service of palladium jewelry for retailers. This series of articles featuring the manufacturing of palladium jewelry is offered to enhance your working knowledge of palladium on the sales floor and at the jewelers’ bench. 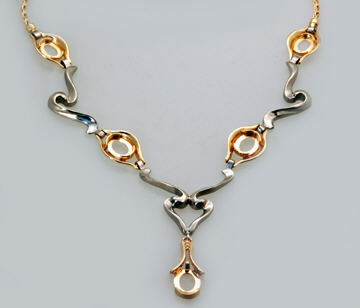 This installment features information, tips and techniques for working with palladium through a manufacturing sequence required to produce this necklace and earrings. These pieces were cast by TechForm, Portland, OR. Palladium has a lower melting point and specific gravity than platinum but still requires the use of platinum casting materials and procedures. 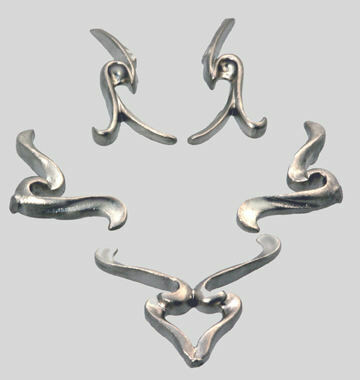 (An overview of palladium casting techniques was published in the June 2006 issue of JCK.) Shown are the cast palladium links for the necklace. There is a rough surface on the cast links even though the wax model was smooth. This is due to the nature of the shell and investment mold used for the casting process. Even though the necklace links were small and lightweight, multiple gates were used requiring extra removal time during the pre-finishing operation. The links were filed with No. 4 files and sanded with 220, 400 and 600 grit 3M micro-finishing film sanding sticks. Tip: Filing and sanding palladium requires an extra step or two over pre-finishing techniques used for karat gold but less steps than when pre-finishing platinum. The bottom surfaces of the links were sanded with a Foredom variable speed motor and 3M diamond polishing cloth with grits ranging from 400 to 3,000. A protective material was wrapped around the operator’s holding finger to enhance safety. Tip: 5 grits were used to pre-finish the bottoms. A lustrous finish remained after the last step using 3,000 grit. The small variable speed motor was placed in a metals retention pan. When this process is completed, it’s easy to collect the resulting debris for refining. Coarse silicone polishing wheels (white) were used to reduce the rough surface and to remove the parting lines from the top portion of the links. Tip: This step was done to blend surface irregularities. Pre-finishing and pre-polishing steps can generate significant waste. To minimize flying debris and collect it more efficiently, a fish-mouth style dust collector was modified with Plexiglas and mounted vertically. This adaptation shields the user while maximizing visibility and waste collection and allowing more bench space. Tip: The fish-mouth is connected to a bench side dust collector, vacuum and filters which trap the precious metal waste for refining. 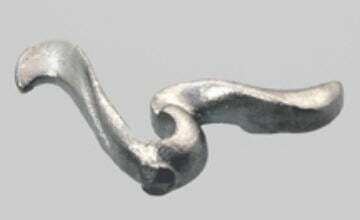 The links had small connector pieces in place on the wax models but failed to fill during the casting process. 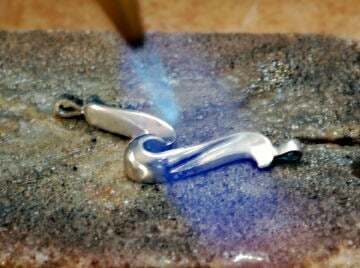 After casting and pre-finishing, replacement jump rings were attached by tack welding using ABI’s Tack II with pliers leads. Tip: Palladium flow characteristics are poor and thin or inconsistent areas in a model are vulnerable to no-fill. A parallel pliers lead is attached to the negative terminal of the tack welding unit and a brass lined pliers lead is attached to the positive terminal. 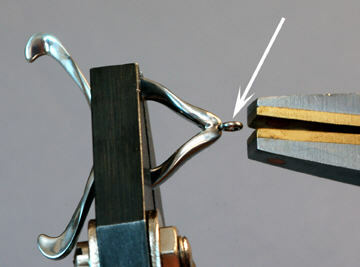 The jump ring is being held by the brass pliers lead. 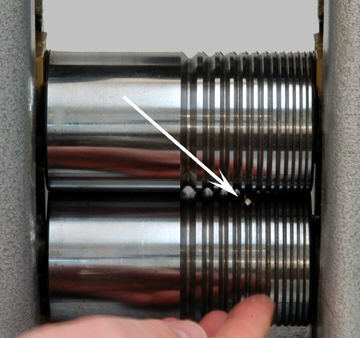 A single pulse of energy is released by depressing the foot pedal and the jump ring is temporarily attached to the center link. 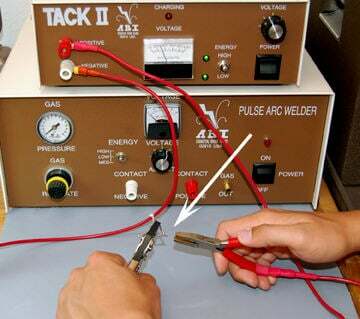 Tip: Tack-welding aids in holding parts in place while soldering. 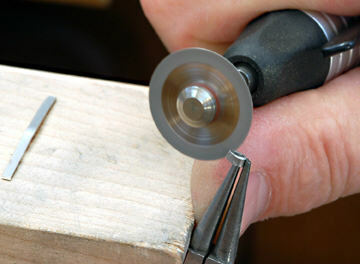 Tungsten carbide or titanium tipped tweezers should be used to hold parts when they are not tacked prior to soldering. The connector jump rings are soldered using easy flowing Pd solder. 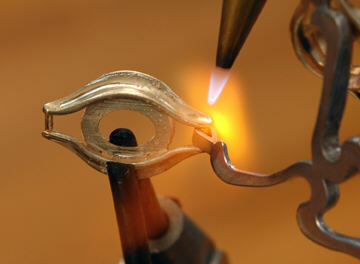 No holding devices are necessary during the soldering procedure because the parts are tacked. Tip: When soldering palladium to palladium, no firecoat solution or flux is required. Use rated No. 5 or darker welding lenses for eye protection during high heat palladium soldering applications. Palladium will loose its polished luster during soldering but it is easily restored through minor re-polishing. Palladium solder is available in hard, medium and easy flowing temperatures or lower temperature platinum solder can be used. To make more connector parts, wire measuring 0.6 millimeters is made from square wire stock. The 950 palladium square wire is annealed by placing it on a platinum soldering block and directly heating and bringing the temperature of it up to an orange glow. The torch is held on the wire only moments after it reaches the orange glow. 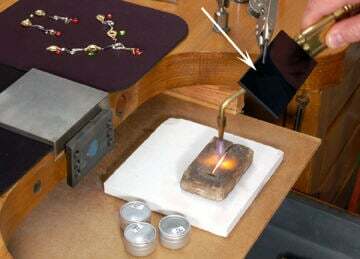 Tip: Use a platinum soldering block for annealing and soldering parts. Also use eye protection. In this example, a No. 5 rated welding lenses is used to shield harmful white light. 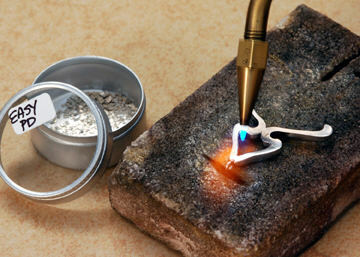 For soldering karat gold to palladium, the item should be protected with firecoating solution. Standard gold soldering flux and easy flowing gold solders should also be used. After annealing and cooling, the size of the wire is reduced in the rolling mill. 950 palladium is malleable and can be cold worked far longer than karat gold. The square wire is rolled flat. Tip: Make sure your rolling mill is free of waste and debris from gold and platinum rolling projects. Use clean rollers to avoid metal transfer and contamination. The next step is shaping the pear shaped connector parts from the flat wire. 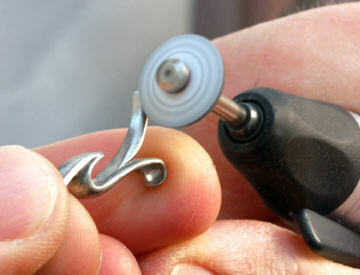 After cutting and shaping each link, a thin diamond cutting wheel is used to flatten the wire ends. The connectors are tacked and then soldered using easy Pd solder. 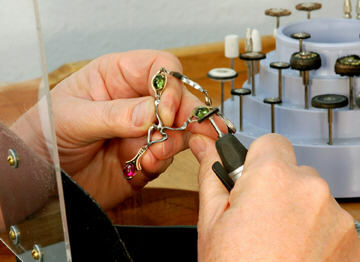 Tip: With the tacked parts, a mild but direct soldering technique is used to join the pieces. 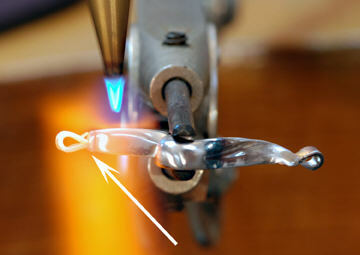 When cast, the spacer wire at each end of the wax models is there to keep the link aligned during the casting process. It is removed and holes are simultaneously drilled through each side of the link ends after casting. The wire is threaded through them and the pear shaped palladium connector. The gold link is firecoated, fluxed and soldered. Different than platinum, palladium loses its polished luster when soldered. Notice the small area of bluish surface discoloration in the middle portion of this link. The polished luster is very quick to restore using a torch with natural gas and oxygen and a neutral flame and the discoloration disappears. All of the links are soldered, assembled and ready for setting and final polishing. 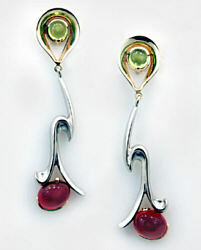 Partial bezels or partial bezel and prong combinations are used to secure the cabochons in the necklace and earrings. Final polishing required 3 steps for both the karat gold and palladium. It began with 800 grit compound using a small polishing brush and wheels. For the second step, 4,000 grit compound, brushes and wheels were used. For the final step, 8,000 grit compound was used. 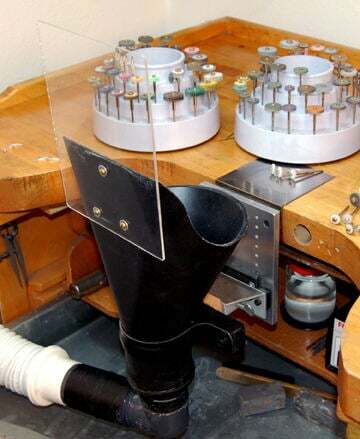 Tip: The first step of the final polishing process is done without the gemstones in place. The weight of the necklace is very light. The specific gravity of palladium is nearly half of the weight of platinum so the larger links do not weigh the piece down when assembled. In fact the weight of the palladium links is comparable to the same made in white gold. 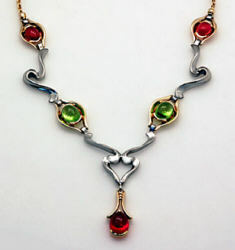 The color distinction in two-tone jewelry is an obvious advantage. The palladium is white with a bright polished surface alongside the high polished yellow gold links – a contrast difficult to discern between yellow and non-rhodium-plated white gold. As a member of the platinum group of metals (PGM) palladium is white and therefore stays white, so plating (and re-plating) with rhodium is never necessary. All rights reserved internationally. Copyright © Mark Mann. Users have permission to download the information and share it as long as no money is made. No commercial use of this information is allowed without permission in writing from Mark Mann.This article was first published in Jewelers Circular Keystone magazine.